The St. Herman House - FOCUS Cleveland is an Orthodox Christian house of hospitality. We are a non-profit, 501c3, charitable organization committed to serving the homeless and needy poor of Ohio City and Inner City Cleveland in a spirit of love and hospitality. We have been in operation since September of 1977. St. Herman’s is solely owned and operated by FOCUS North America which conducts outreach centers and programs in 30 cities around the country. As an expression of Christ’s love, FOCUS North America serves the hungry, thirsty, stranger, naked, sick and imprisoned by providing Food, Occupation, Clothing, Understanding, and Shelter. Faced with low wages and rising food, housing, utility, and health care costs, thousands of children go to bed hungry each night, evicted families are homeless, millions are jobless, and even more feel hopeless. In a land where resources are so plentiful, it is unacceptable that so many children, adults, and senior citizens experience such staggering need and insecurity. Out of all US cities, Cleveland has the second highest rate of residents living below the poverty line, 36%. At a time when few to no services were available in the Cleveland area, St. Herman House was founded to meet the pressing needs of the underserved in our community. To this day, the St. Herman House continues to provide essential services, transforming the lives of many who come through our door. FOCUS North America is a national movement of Orthodox Christians, united in faith and joined by a desire to provide action-oriented and sustainable solutions to poverty in communities across America. This podcast regularly updates you on the work and stories of FOCUS North America and tells you how you can participate. Fr. John Tolumes is the priest at Holy Trinity Orthodox Church in the North Hills of Pittsburgh. The title of this Focus North America related sermon is "I Feel Really Loved." Dn. Paul Abernathy is the Focus North American Director of the Pittsburgh Center. He joins Nick and John to talk about how spirituality and mercy walk hand in hand. Youth Equipped to Serve Program Director Katrina Bitar and Orange County FOCUS Director Caroline Ashkar talk about the impact of YES on youth and their families. Giving of time, talents, treasure; How FOCUS helps churches and groups of people setup activities and events to minister to the needy in their communities. Nick Chakos tells us about 2 job openings in the ministry as well as the gift catalog where you can earmark your year end gift to Focus North America. In this new episode, Nick Chakos introduces us to Eric Shanburn, Detroit Center Director, about transitional housing and life transformation for the people served by Focus North America. Learn about the Summer Feeding Program at FOCUS North America and learn how your family can be involved in feeding hungry children right here in the US. Nick and John speak with Paul Finley about the incredible work of St. Herman House in Cleveland offering hope and dignity to Cleveland's homeless population. Learn about the expansive program that provides shoes and more to over 252,000 children in America. 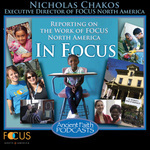 Nick Chakos and John Maddex introduce you to the new official podcast of FOCUS North America and give a broad overview of the services offered by FOCUS to address poverty in communities across America. Paul Finley (right) pictured with house Manager Roy. Carl Cook, serving up one of his many amazing dishes he creates with food donated from the community.